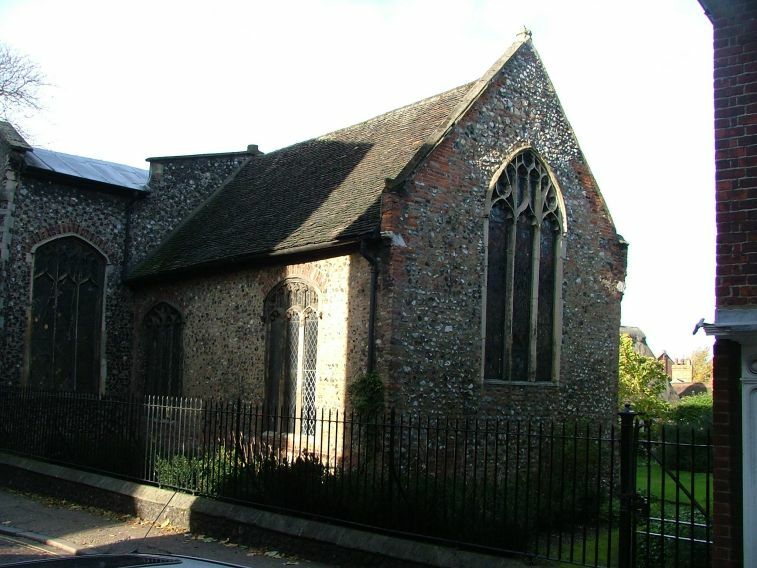 At the time of the 16th Century protestant Reformation, Norwich had 36 parish churches, and many of these buildings survive today. A handful are still in use for the congregational worship of the Church of England, for which they were never designed of course. Others have found uses as concert venues, artist workshops, day centres and offices. One houses the Norwich Probation Servce, another is even a Pregnancy Advisory Centre. Some stand empty, but far more are in use now than were ten years ago. It is the largest collection of urban medieval buildings in any one city north of the Alps. 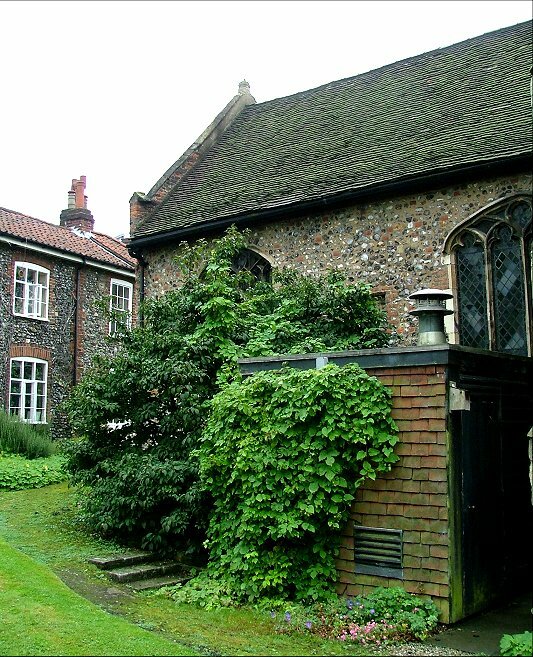 Although St Peter Hungate is right in the heart of the urban area, its setting is idyllic; 16th and 17th century cottages flank the north and east sides, and then beautiful Elm Hill drops away below it. To the west is the magnificent chancel window of the Blackfriars church, while to the south are grand 19th century commercial buildings, full of Victorian confidence. Hungate itself no longer exists, but was formerly 'houndsgate', the street of dogs. 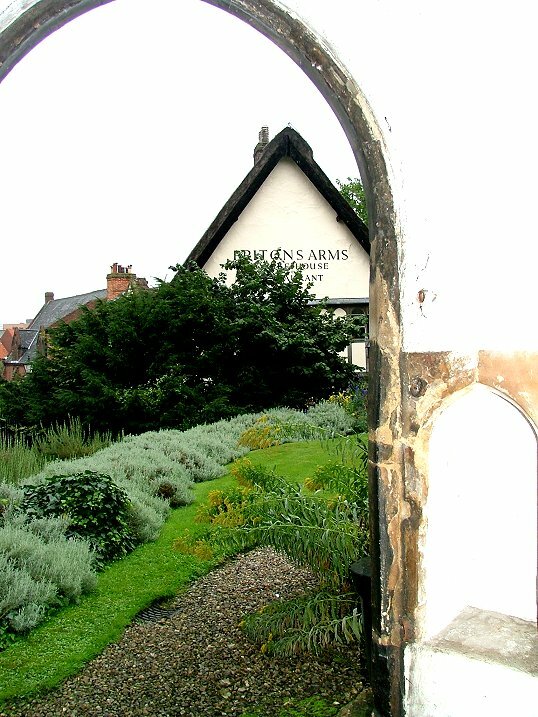 In this conservation area the roads are cobbled, and it is an oasis of charm in the middle of East Anglia's biggest city. 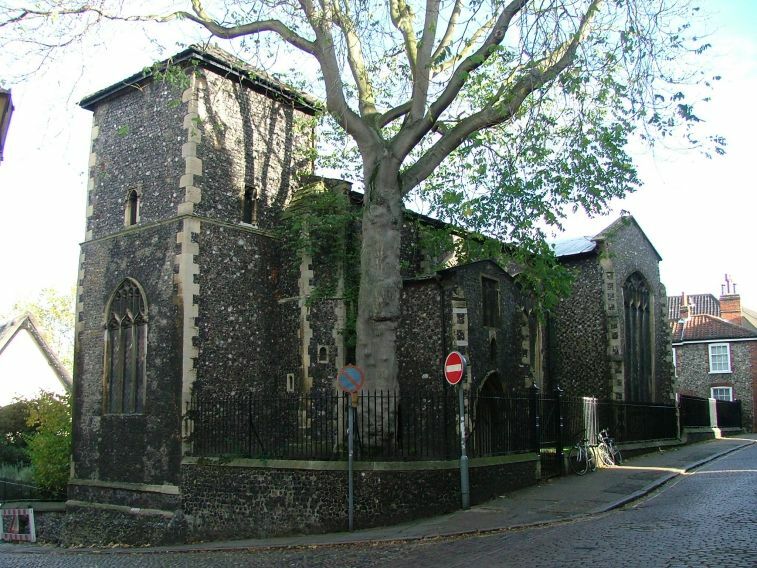 St Peter is that rare beast in Norwich: a cruciform church. It looks older than it actually is; the primitive capped tower is actually a tall 15th century one that was truncated in 1906 for safety reasons. In fact, the whole church was completely rebuilt during the middle thirty years of the 15th century. The chancel collapsed after the Reformation, and was rebuilt by the Laudians in the early 17th century. It is a blessing that they reused the 15th century windows, and in fact most of the window tracery in the church is still original. 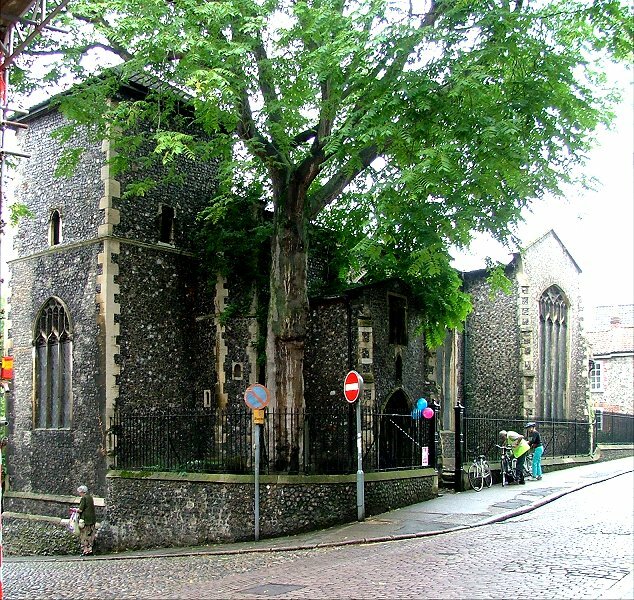 In the 19th century, St Peter Hungate was one of the highest of Norwich's many Anglo-catholic churches; it was the first to use vestments, the first to use incense, the first to use candles on the altar. 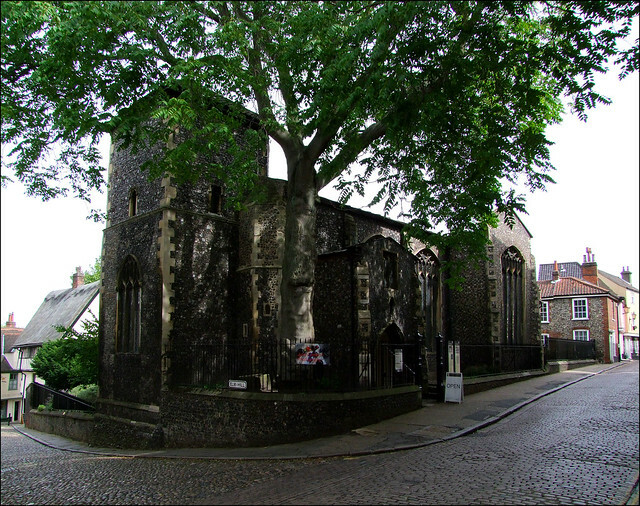 However, as with St Simon and St Jude at the other end of Elm Hill, St Peter has long been redundant, last being used as a church before the First World War. 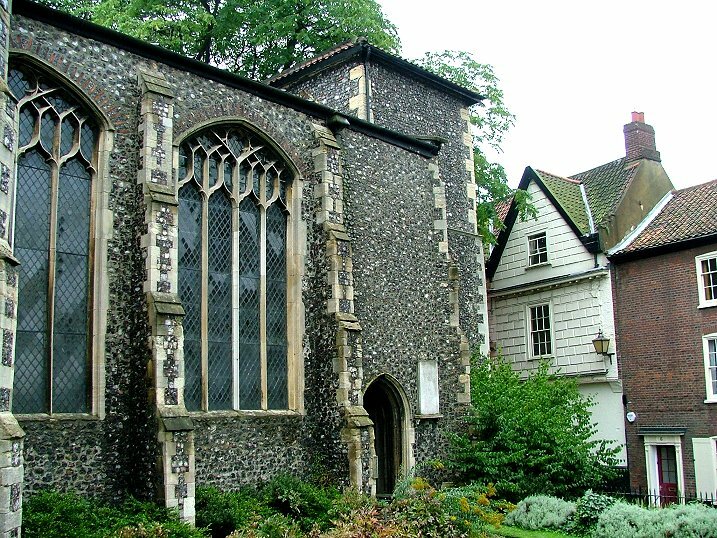 When, in the 1930s, the Norwich Society went on their pioneering crusade to save this area of the city, there was a renewal of interest in finding appropriate uses for the old churches, and in 1936 St Peter Hungate became a museum of church furnishings. 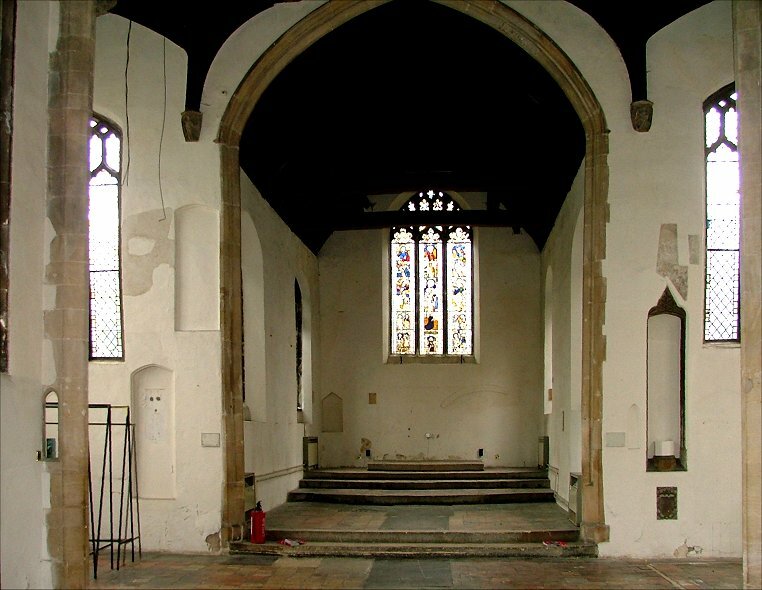 The fixtures and fittings from other redundant churches were brought here for display, and the collection was augmented by items from the Norwich and Norfolk museums, as well as by other churches wanting to find a safe home for their treasures. It was a superb museum, the only one of its kind in England. From a church explorer's point of view, it was a priceless resource; you could read about things, and then go and see them in real life, all in one place: rood screens, bench ends, reredoses, corbels, pyxes and pyx cloths, all at first hand. 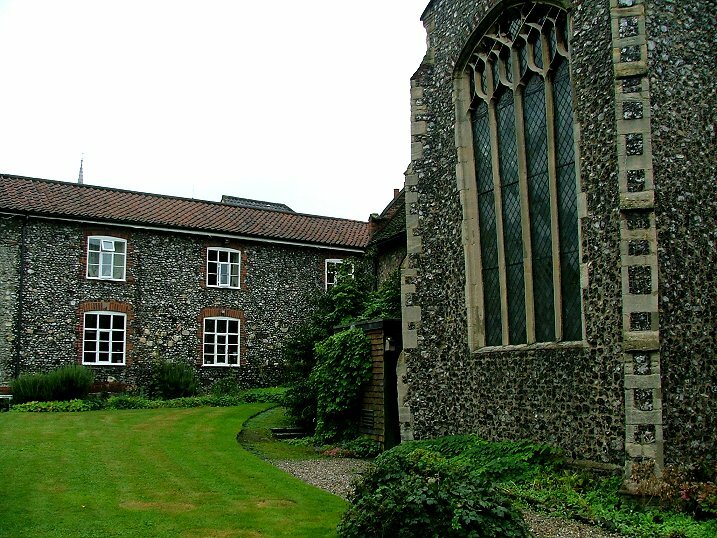 St Peter Hungate Museum of Church Art lasted until the late 1990s, when a reorganisation of the museum service in Norwich killed it off. All the exhibits were removed, and most went into storage under the Castle. For nearly ten years, the building was completely empty, and can be seen as it was in 2005 in these photographs. In 2006, a small group of people came together in an attempt to get Hungate open and in use again. 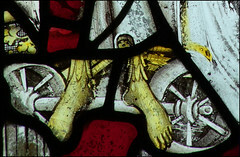 Their plan was to use it as an interpretation centre for Norfolk's medieval heritage, with a particular emphasis on the medieval stained glass artists of the city of Norwich. 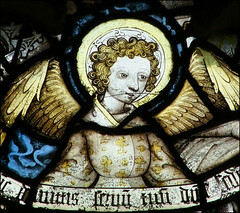 St Peter Hungate is a good place to do this, as it has the best collection outside of the cathedral in the whole city. This glass, largely of the 15th century, is partly from St Peter Hungate originally, and partly a consequence of the medievalist enthusiasms of the 19th Century, when much was collected and brought here. It includes a sequence of the Order of Angels, other angels holding scrolls, the Evangelists, the Apostles, and much else besides. Here are some highlights. 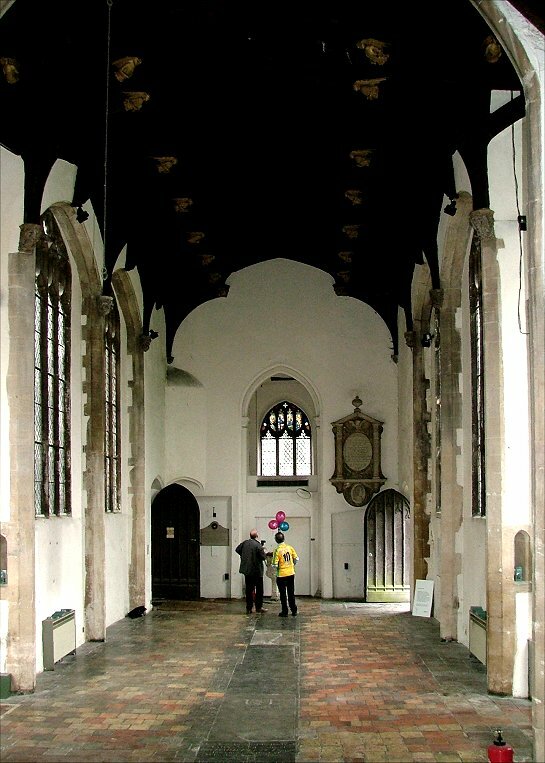 There are squints into the transepts, and image niches in the east walls of both; the south transept, which was a chapel for the guild of St John the Baptist, was the burial place of Sir John Paston. High above, the corbels to the roof are finely gilded; they depict the four evangelists, St Matthew, St Mark, St Luke and St John, and the four Latin Doctors of the Church, St Augustine, St Ambrose, St Gregory and St Jerome. This is the only known example of these eight Saints as roofpost stops. There is a central boss of Christ in Judgement. The fixtures and fittings of the new Hungate Centre are much less intrusive than those of the old museum, allowing a sense of space and light. Display cases down the sides of the nave explain and interpret the history of Norwich's stained glass industry, and between them are the lovely benches from Tottington, which I had last seen marooned within the fences of the Battle Training Area. There are temporary exhibitions which use the transepts and chancel, and regular activities for adults and children. The Centre is currently open three days a week, and you can read more about it on its website. If you go out through the north door, you find yourself in the former graveyard, now a pleasant garden overlooking the rooftops of Elm Hill. 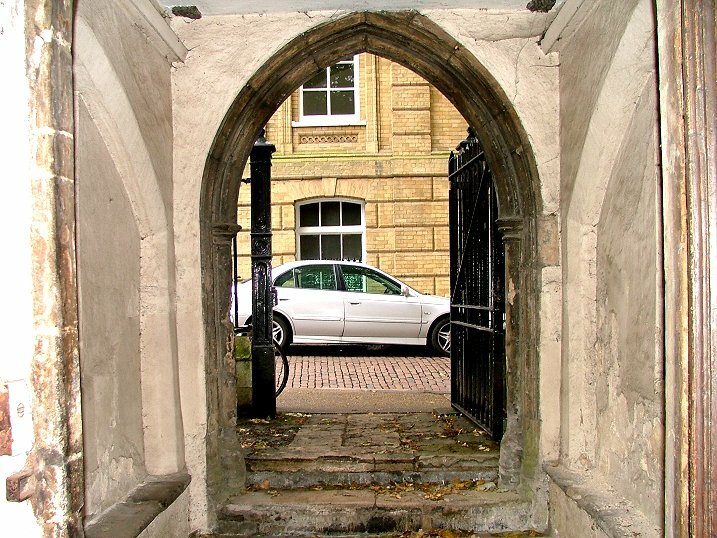 The 15th century building immediately to the north, now a restaurant, was once a beguinage, a retreat house for nuns. The lawn is surrounded by lavender and rosemary, and it is all very well kept. All in all, this beautiful space, now once again in safe hands, is much to be celebrated.